It’s no secret that Facebook Ads are a powerful tool for marketing your business. As of March 2016, more than 3 million companies were taking advantage of the platform, and their spending represented 19% of the $70 billion spent worldwide on mobile advertising . That said, I’m not going to spend this article telling you how to set up Facebook Ads or showing you all of the platform’s various features – you can find that kind of technical “how-to” info anywhere – and I’m not here to rehash something you can find elsewhere online. What I want to share with you is something vastly more important to the overall success of your campaigns: how to use Facebook’s targeting options to reach target audience members at different stages of your sales funnel. Armed with the practical knowledge you’ve picked up from other resources (or from running your own campaigns) this strategic insight will help you maximize your business’ growth with Facebook Ads. 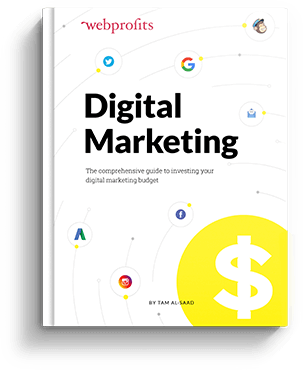 As a marketer, you have dozens of channels into which you can invest your advertising spend, from paid ads like those found on Facebook and Google’s advertising platforms, to content marketing, social media marketing and more. In practice, Facebook Ads are one of the best growth drivers for business – possibly one of the best growth channels in general – thanks to the unprecedented level of control the network’s extensive social data offers when it comes to demographic and psychographic targeting. 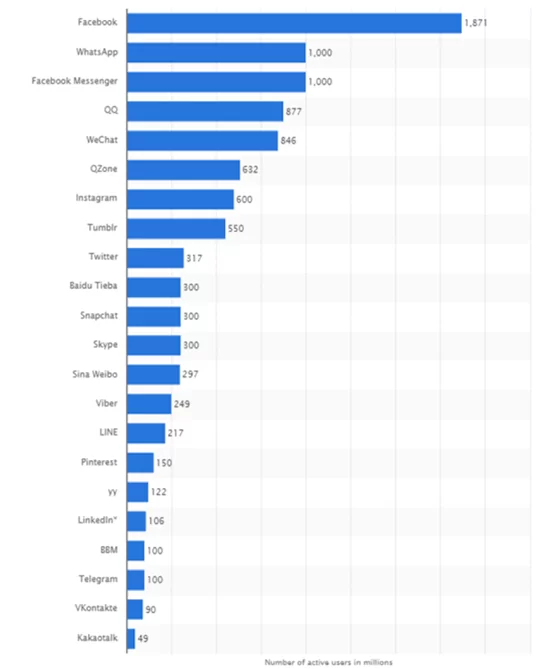 As of January 2017, Facebook reached 1.87 billion monthly active users worldwide, relative to Twitter’s 317 million, Snapchat’s 300 million and LinkedIn’s 106 million (Instagram, which counts 600 million active users, is owned by Facebook). Thanks to Facebook’s inherently social nature, the platform has captured significant volumes of personal data – from users’ occupations and interests to their social connections and the brands they like. These data points, among others, give advertisers an incredible level of control when targeting their messages. Facebook offers a wealth of tools for brands hoping to reach Facebook and Instagram users, including the ability to upload customer data to Facebook as part of a Custom Audience, to target these groups with ads, and to create Lookalike Audiences consisting of users with similar characteristics as those found in your Custom Audiences. Facebook Ads’ matching algorithms leverage the latest in machine learning , which helps ensure the right ads are shown to the right people, at the right time. This makes using Facebook’s automatic bid optimization option not just an easy one for marketers, but an effective one as well. The network’s broad reach and extensibility means that a tremendous number of tech tools are available to help advertisers target and scale their campaigns. Take, for example, Experian Marketing Services’ Facebook integration , or tools like Qwaya , Driftrock and others that facilitate the process of placing, testing and measuring ads. The Facebook Ads platform is often lumped into the general pay-per-click category with another popular platform – Google AdWords. And although they share some features, advertising on these two platforms requires a very different approach. Google AdWords, for starters, is a search-based platform. When someone searches for something online, you can use AdWords to put your ads in front of them. The exact position of your ads is based on your bid and your website’s quality. The only way you can gauge user intent is by the specific queries they’re entering. Imagine you sell Converse shoes. While you could run AdWords campaigns based on broad queries like “online shoes” or “men’s shoes,” you’d likely want to tailor your ads to keyword phrases like, “buy Converse Allstars online” “Converse shoes [your city]” or even “best price Converse Allstars online”. These more specific queries indicate that searchers are ready to buy. Putting your ads in front of them at that point gives you the best odds of driving business. In this way, Google AdWords is essentially the “easy way out.” Searchers are already showing interest in what they’re searching for (and what you’re selling). Facebook Ads, on the other hand, are a little more complicated. On Facebook, people aren’t searching for anything in particular. In fact, they generally aren’t searching at all. They’re there to pass the time, to connect with friends and family members or to be entertained by the content they encounter. This poses a major challenge to marketers. Despite your ability to drill down in your targeting options to ensure your ads are reaching the people who are most likely to be interested in your products or services, you’re still presenting a commercial message in what they perceive to be a non-commercial space. 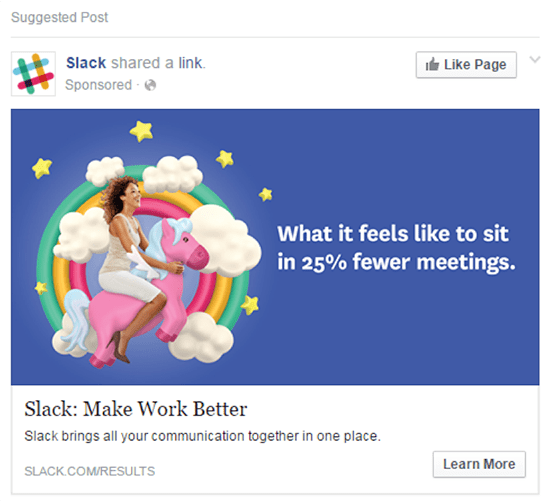 You’re still “interrupting” their social experiences with advertising. Resolving this potential conflict comes down to your ability to identify intent. In fact, I’d argue that intent-based targeting is the most important factor in making your Facebook Ads successful, while the ads you create are secondary, based on the audiences you’re targeting. The Converse shoes ad campaign we talked about earlier, for instance, would be out of place if the Facebook user hadn’t expressed any interest in a purchase. You can see how it’d be significantly more welcome if the user had just finished searching Google for Converse shoes. With Google AdWords, intent is indicated within the search itself. On Facebook, your path to advertising success is more complicated. In addition to identifying intent, it’s up to you and the ads you create to build relationships and stoke desires – all within an environment users would prefer to be free from advertising messages. On Google, you can identify buyer intent by the phrases they enter into the search field. Intent on Facebook, on the other hand, is all about behaviors – and those, we identify through Audience Targeting. Let’s take a look at each of these in more detail to see how they can be used to measure intent. 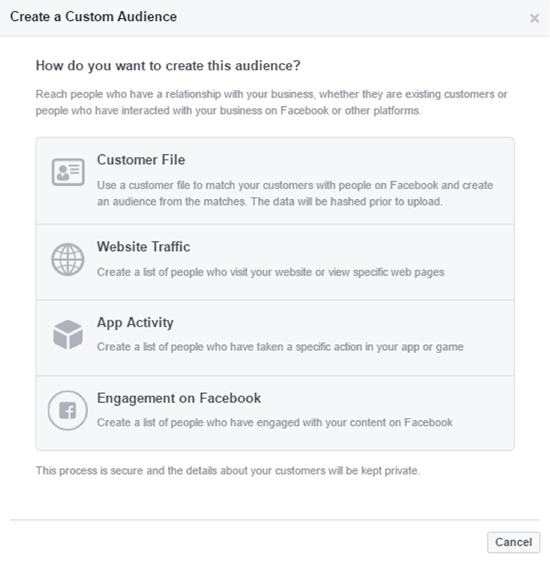 Facebook Custom Audiences let you leverage your existing customer data to target your ads towards your current customers or to people who have had some type of measurable engagement with your brand. Some estimates put the cost of attracting a new customer at five times more expensive than selling again to an existing client . This is why Custom Audiences perform better than other types of ads; you’re able to use them to reach people who already have a relationship with your brand. The list goes on, but these examples alone should get you thinking about all the different combinations of website, email, app and phone data you could use to target your ads. Just remember: Custom Audiences are where you’ll generate leads and/or sales. When plugged into his system, Ramondo claims to have been able to create ads built around these Custom Audiences that have driven $163,969.49 in 43 days, off a $5,989.09 spend. 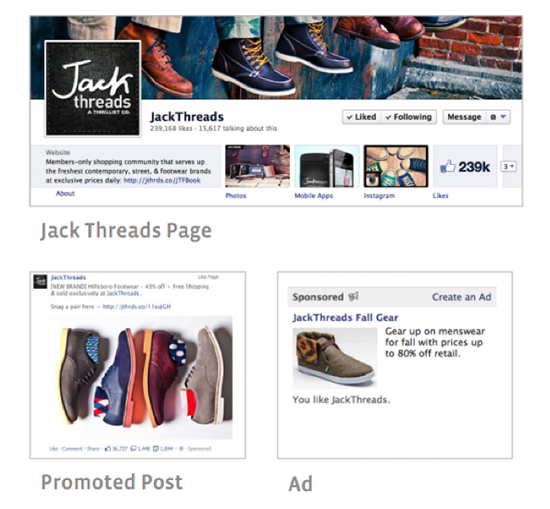 JackThreads, a men’s streetwear shopping club featured in a Facebook case study also used Custom Audiences to meet their goals (in this case, driving 1 million new email opt-ins). At first, JackThreads started with Core Audiences, aimed at reaching men ages 18-30 who had past Likes and proven interests around hip hop and rap music (for example, having Liked the artist Drake). As their email list grew, JackThreads used Custom Audiences, uploading segments of its 2 million member email list such as “people who haven’t opened an email in 30 days” and “people who have never opened an email.” Each of these segments was then targeted with relevant messages and creatives designed to drive brand name awareness, ultimately driving leads to the “Conversion” funnel stage. After Custom Audiences, Lookalike Audiences are the next-best-converting type of audience. Though his list isn’t exclusive, the options above represent a good place for most new Facebook advertisers to start. To create a Lookalike Audience, you’ll take the same customer list, retargeting/website data, Facebook connections or app data you used to create your Custom Audiences and ask Facebook to create a Lookalike Audience comprised of users who share similar qualities and characteristics. When you’re creating your Lookalike Audience, you’ll be given the opportunity to choose between a 1% and a 10% match (based on an individual country’s population on Facebook), as well as to specify a target country where you’d like leads to reside. Lower-percentage matches (starting at 1%) pull the leads that are most similar to the members of your Custom Audience. Higher-percentage matches (as high as 10%) pull broader audiences that may not be as closely related to your initial group of audience members. Understandably, higher-percentage matches will create larger groups of users than a more selective lower-percentage match. Currently, in the U.S. a 1% Lookalike Audience includes about 2.1 million people; in Australia, it’s around 157,000 people (note: each percentage point represents 1% of the number of people who use Facebook in each country). When you first start using Lookalike Audiences, begin with a 1% match and increase your percentage points from there as needed (making sure to exclude your previous audience from your next campaign). Expect that your conversion rates may go down as your audience grows larger and their specificity diminishes (though this doesn’t occur in all cases). The key to making Lookalike Audiences work is to use the cleanest data source possible so that Facebook’s algorithms will match your audience with the right people. As a rule, it’s always better to use a smaller, more accurate source of audience data than a larger, inaccurate list. Imagine, for example, that our athletic shoe seller decided to get into Lookalike Audiences. 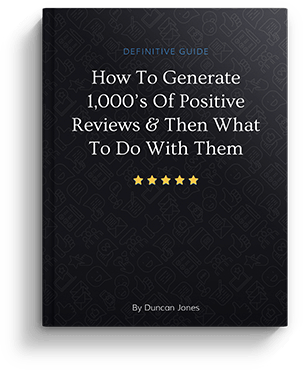 If they had to choose between a small list of customers who purchased within the last three months and an un-scrubbed list of freebie email subscribers built over the past three years, they’re almost certainly going to get better results from the customer list. 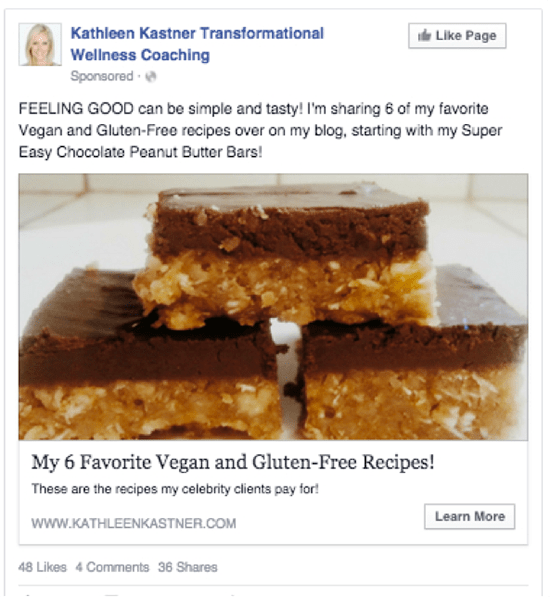 Wellness coach Kathleen Kastner decided to try Facebook Ads marketing around the same time that the platform was rolling out stricter restrictions on what kinds of language could be used with regards to promises of weight loss. According to Lakhani, the campaign was able to achieve a CPC of just $0.65, a relevance score of 10/10 and a CTR of 5%, beating the industry average of 1-2% . Location-based audiences are defined by users’ locations within established country, state, city or postal code boundaries. Local businesses might use these targeting features to ensure their ads aren’t displayed to those outside of their geographic areas, while e-commerce sellers might use them to exclude buyers who live in countries they don’t ship to. 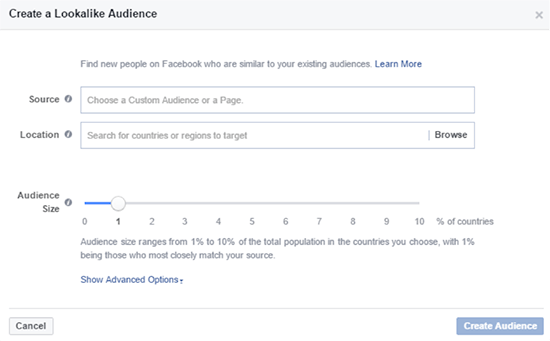 Demographic targeting options on Facebook might encompass age and gender, but might also include things like education, employment, household/marital status and other lifestyle details (such as generation or ethnic identification). Some of these targeting options are only available within the U.S.; others are open to marketers worldwide. Interests-based audiences can be controlled according to the interest information Facebook has captured about its users. This information is typically gathered based on the posts users share on their profiles, the pages they Like and the apps they use, and is broken down by categories and subcategories that enable advertisers to hone in on specific interests (such as the sports they enjoy, the TV shows they watch or the types of clothing they purchase). Behavior targeting typically relies on data made available by third-party sources, on users’ internet activities, past purchases or pre-purchase behaviors. Partner data, for instance, may reveal the likely creditworthiness of users, their willingness to donate to charity or their interest in travel. As with interests targeting, multiple behavior categories and subcategories exist (and may not be available in all locations). 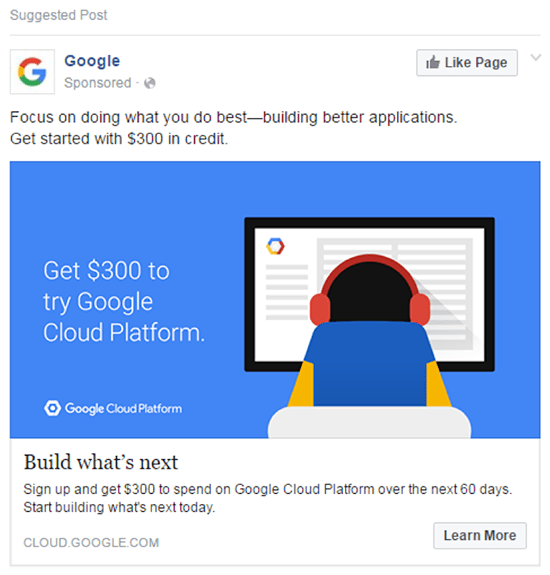 Finally, Facebook Ads can be targeted to people who already have connections with your business. This could include people who have Liked your page, those who attended a past event of yours or those who interact with your Facebook app. All of these targeting options have their place, but Core Audience targeting is generally the least effective type of targeting . When you use Core Audience targeting, you’re targeting by characteristics – not necessarily actions or intent. Just because somebody likes ‘running’ as an interest, for example, doesn’t mean they’re necessarily interested in purchasing running shoes at the time. There are exceptions to this rule, of course. Targeting based on hobbies, sports fanaticism or passions where users are particularly interested in specific topics may be enough to convert them right away. In general, though, with Core Audience targeting, the users you reach will be “cold” to your brand, making them among the hardest to convert. 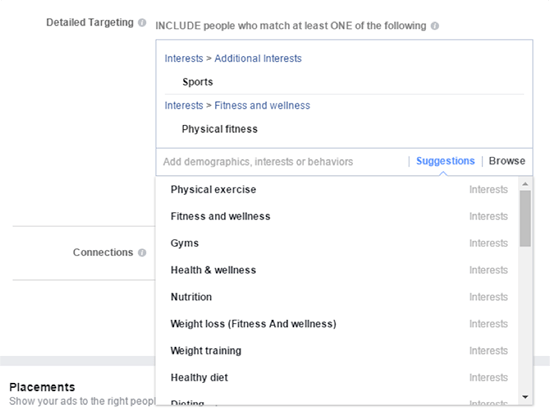 Narrowing down your Core Audience with multiple behaviors and interests (now possible, thanks to Facebook’s conjunctive targeting feature ) can help. 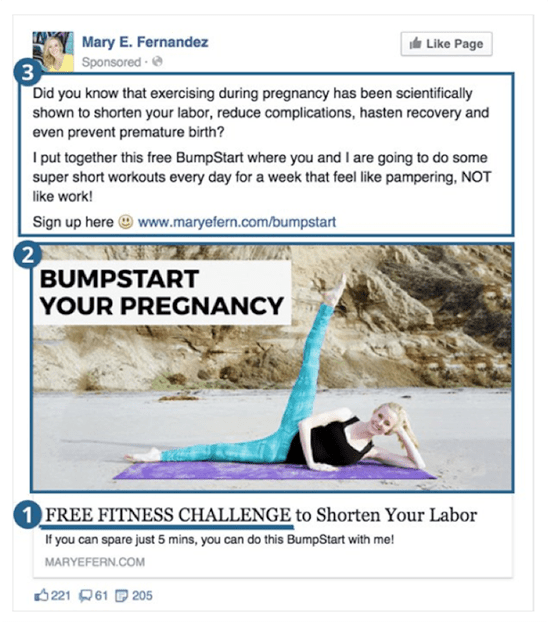 Take the example of fitness pro Mary E. Fernandez, who used Facebook Ads to promote her pregnancy fitness program, Bumpstart. Through Facebook Ads, Fernandez was able to add 532 new subscribers to her list in 43 days, for a total cost of $227.05 . Another example from VeeRoll shows how Core Audiences can be combined with Lookalike Audiences to achieve even greater results. As part of their campaign, VeeRoll offered new subscribers a 30-day free trial to the PRO version of their video ad marketing tool . Their campaign on Facebook consisted of two phases, incorporating “cold” interest-based targeted users, Lookalike Audiences based on existing email subscribers and “warmer” visitors who engaged with an earlier ad. 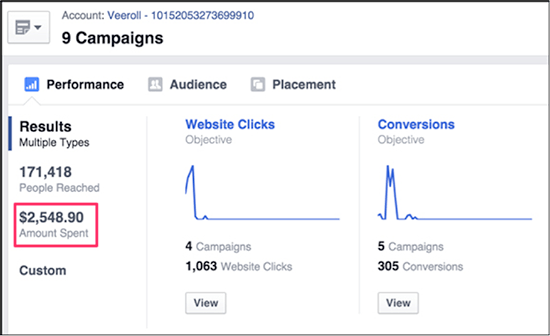 At the end of the campaign, VeeRoll had attracted 122 new trial customers in two weeks, with an ad spend of $2,500 – all thanks to the power of Facebook Ads’ targeting options. Knowing all of these audience targeting options is one thing; building them into an active campaign is another. You may not even need to use this many steps. You may, for example, find that creating Custom and Lookalike Audiences based on your existing customer data drives enough conversions to meet your advertising goals or uses all the budget you have to allocate to Facebook Ads. 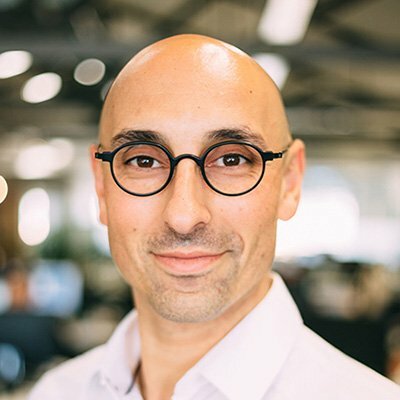 However, if you’ve taken the first step recommended here – building Custom Audiences off your customer data – and want to take your campaigns further, move on to the remaining steps in order to scale your results. Proper audience targeting is a must when it comes to Facebook Ads, but it’s only half the battle. In addition to determining who you should be reaching out to, you also need to carefully consider what you’re telling them. This is where your understanding of your company’s sales funnel and the intent of your audience members comes into play. Exposure is all about general awareness – think of it as the first time someone encounters your brand. This may happen on your site or on another web property (yours or someone else’s). Awareness involves prospects taking early actions to learn more about your brand, such as visiting your website or reading your social media posts. Trust/credibility requires that you prove to prospects that you, your products or your services have the capacity to meet their needs. Consideration occurs when prospects think about purchasing from you and become leads. They may reach out directly or start a free trial, but they’ll still need help overcoming objections and differentiating your brand as superior to your competitors’. Your sales or conversions occur once you’ve answered your leads’ questions and convinced them of your brand’s credibility. 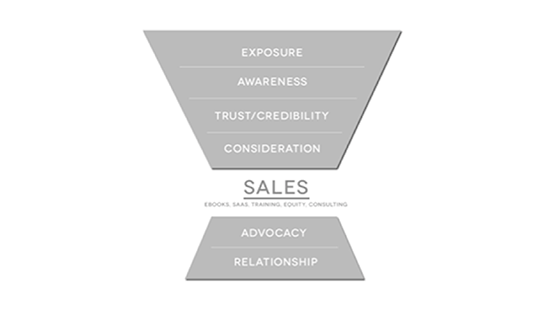 After sales, the advocacy funnel stage involves turning new customers into brand advocates who like your offerings enough to refer other new customers to you. Finally, building relationships involves more than simple advocacy. It’s about becoming more than a vendor to your customers and creating relationships that exist outside of business and money. For the purposes of Facebook Ads, we’re really only concerned about the stages starting from awareness (w e can skip exposure since, for the most part, your Facebook Ads will be asking people to take action. In a sense, they’re combining exposure and awareness into a single funnel stage – one that involves both introducing your brand and encouraging new prospects to learn more about it at the same time). Lookalike Audiences based on your best-performing Custom Audiences. Any customer data, retargeting or engagement data you have, upon which you can build Custom Audiences, you’ll only have from people who are past the awareness stage in your funnel. Asking new prospects to make a purchase is akin to asking your first date to marry you. Nobody wants to be rushed into a new relationship so quickly! Remember the cardinal rule here as you’re planning your awareness ads: value, value and more value. In later sections of this guide, exposure and awareness ads are discussed together, as they’re often quite similar in practice when it comes to Facebook Ads. Using data from past customer purchases to create Custom Audiences can be particularly powerful in this case. Although the people viewing your ads won’t yet be customers, based on their funnel stage, setting up your targeting in this way can help you catch the leads who are most likely to progress to making sales. 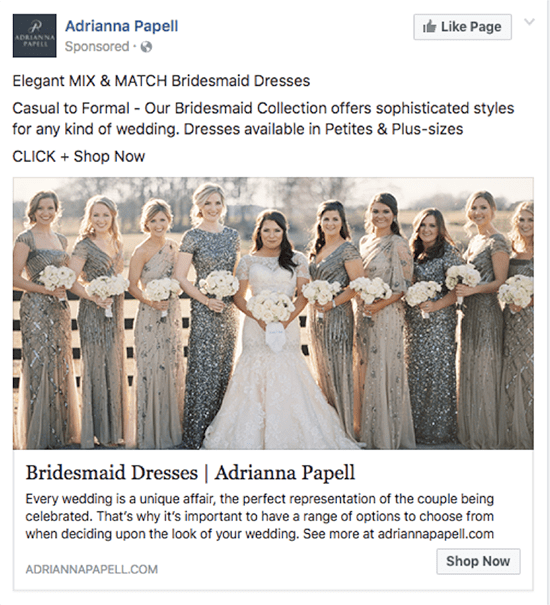 Lookalike Ads are useful here as well because Facebook has matched the audience with your existing customer data, making them more likely to convert than any other non-Custom Audience. If the goal of your paid Facebook Ads campaigns is to drive actual conversions, you’ll need to be especially tight with your audience targeting. Remember what we talked about earlier. People on Facebook aren’t there to shop. They’re there to relax, unwind and connect with the people in their lives. Asking for a conversion – whether that’s a sale, a trial subscription or something else – requires that you only reach out to leads you believe are primed and ready to take action. Skip Core Audiences or Lookalike Audiences in this case, as you won’t be able to ensure that they’ve had the necessary exposure to your brand to be receptive to ads asking for a conversion. You also won’t know whether or not they’re ready to buy, as you’ll have no behavioral data to suggest that. Again, this isn’t a place to use Core Audiences or Lookalike Audiences, as it’s only paying customers that are likely to become advocates for your company. Be cautious when using this type of promotion. Given people’s natural tendency to be suspicious of promotions in their social spaces, it’s best used when you’re confident that the people who receive your messages will be receptive to becoming advocates. With a relationship building campaign, you’ll use only Custom Audiences, as you’ll be reaching out directly to your top advocates in the hopes of expanding your relationship further. 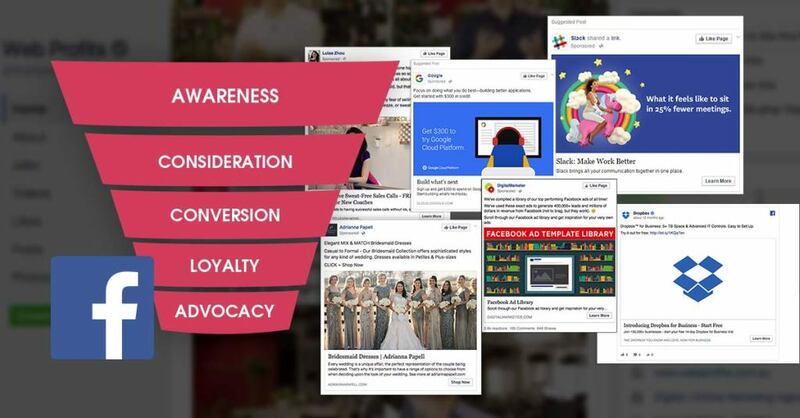 As with the case of exposure and awareness, advocacy and relationship building ads are combined in future discussion, as their aims and execution are very similar in Facebook Ads. 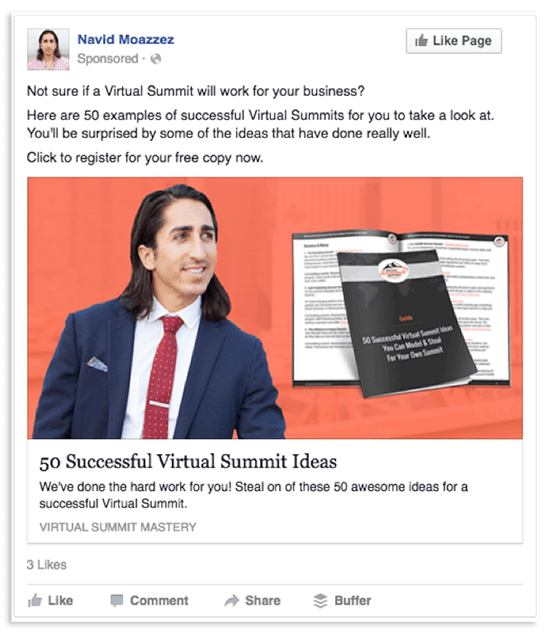 The suggestions above should help you see a clear path forward for your Facebook Ads campaigns. But to make things even easier to implement, let’s break down a few funnel-specific examples by industry types. If you sell a SaaS subscription , your target conversion will likely be a free or paid trial (though, in rare cases, you may be seeking a full purchase from day one). Ads like the following could help move prospects through each of the necessary funnel stages to achieve this goal. A lead-gen business is any service-oriented business that’s using Facebook Ads to find new clients. Doctors, lawyers or consultants, for instance, might use paid ads to drive possible clients to on-site landing pages for future follow-up. For complete instructions on how to set up this type of ad, check out Shopify’s complete article . Marketer Andrew Hubbard partnered with Navid Moazzez to promote Moazzez’s Virtual Summit Mastery program . Before actually running promotions for the course, Hubbard carried out a “pre-launch” series of Facebook ads to build up Moazzez’s subscriber list. When the two were ready to promote Moazzez’s course, Hubbard organized his Facebook Ads into groups targeting four types of warm traffic. 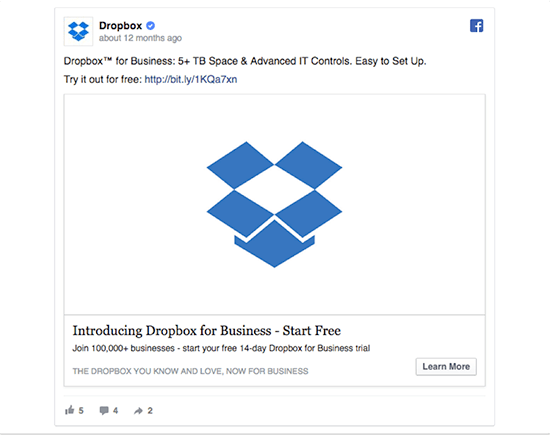 In early 2016, marketer Brian Moran used Facebook Ads to promote his $97 Retargeting Hacks Report, which was backed up by upsells to higher-tier packages, additional training and payment plans. In total, his campaign brought in $14,114 in sales on an ad spend of $8,240.17. 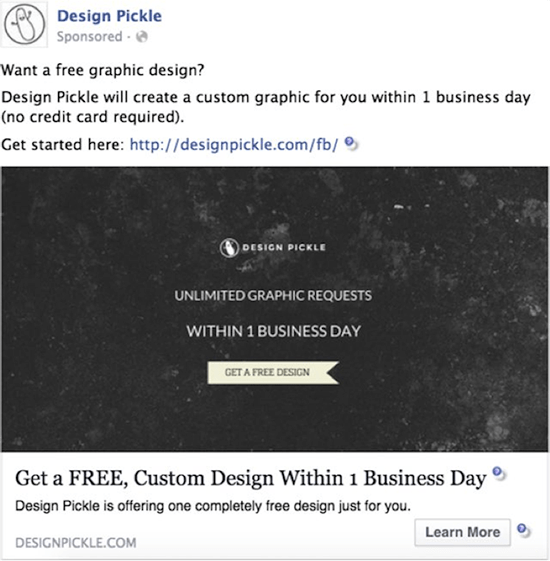 Design Pickle, a new “design-as-a-service” firm offering graphic design on a retainer arrangement, used Facebook Ads to overcome the hurdles associated with bringing a service-oriented new concept to market. Not only did the form help Design Pickle weed out tire-kickers, it gave them plenty of demographic data on which to target future ads. Paired with a retargeting campaign that aimed to convert these leads, the company was able to generate $5,800 in monthly recurring revenue with Facebook Ads. Finally, despite the heavy focus of this article on Facebook Ads, you shouldn’t build your campaigns in a vacuum. Instead, integrate them with the other marketing activities you’ve scheduled for each stage of your funnel to ensure your ads support your overall marketing strategy. Build email sequences for each stage of the sales funnel. 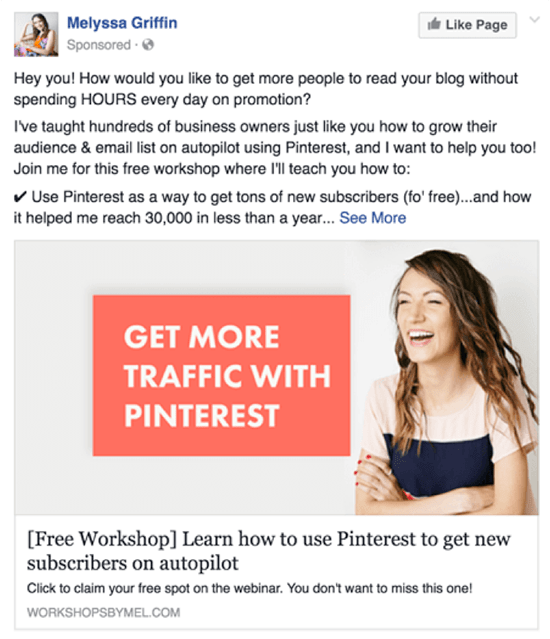 Your Facebook Ads CTA may involve encouraging viewers to opt-in to your email lists. If you do so (or if you want to use these sequences for other marketing purposes), create different series with messages that are tailored to the specific funnel stages your ads are tied to. 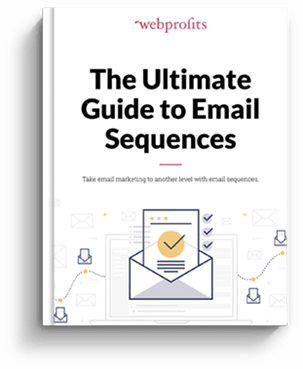 Our Ultimate Guide to Email Sequences gives a great overview on how to do this effectively. Align your ads with other paid channels. Once you’ve gone to the effort of creating and testing different Facebook Ads, use the assets you’ve created on other networks, as applicable, to maximize their ROI. 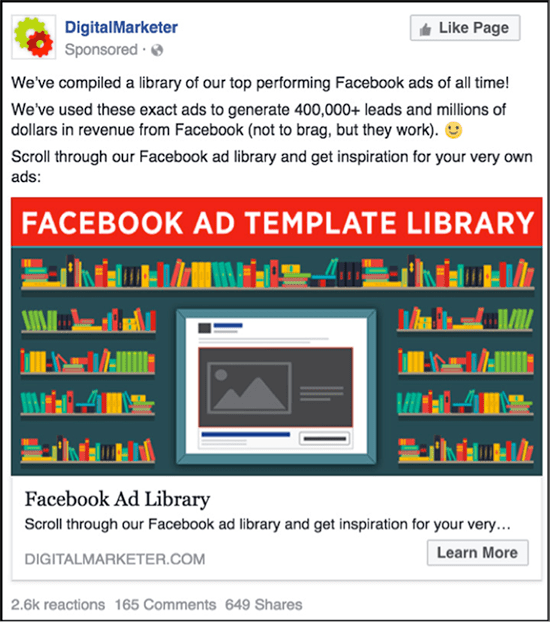 You could, for example, run the same retargeting ads you’ve built for Facebook on the Google Display Network. Keep in mind, of course, that ads may run differently on different networks. You could also use search retargeting for each funnel stage. 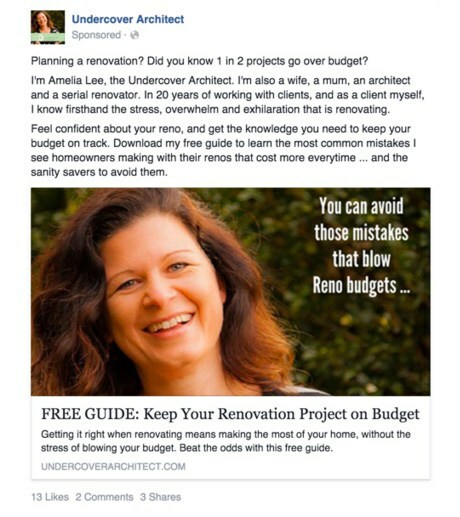 Use your Facebook Ads as a starting point, but don’t forget to test and iterate as needed. Start and stop your ads as people move between stages. Set up your ads so that your campaigns are automatically adjusted based on how people interact with your site. For example, when somebody visits your sales page, your ads should automatically change to start showing them conversion ads. 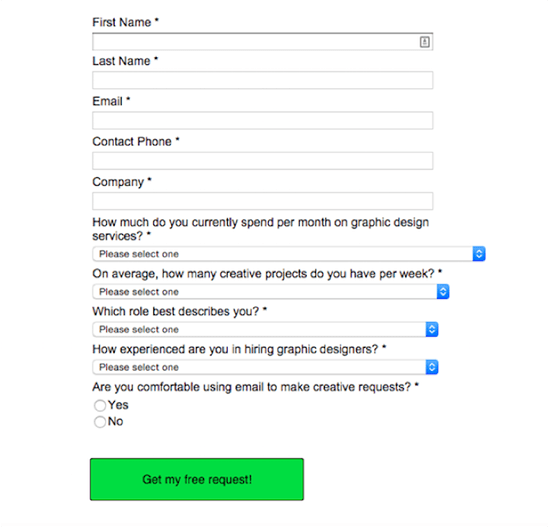 Use landing pages to maximize the performance of your ad campaigns. 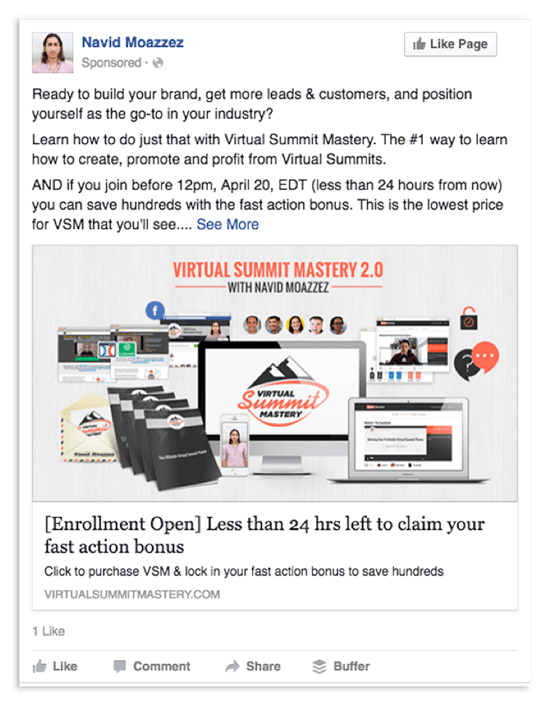 Ultimately, the goal of your Facebook Ads campaigns is profitability. Creating landing pages for each stage of the funnel will give you the maximum possible return on your paid Facebook Ads investment. Think holistically and watch for any indication by your customers that your ads are inappropriately targeted. Your campaigns are living, breathing entities, and it’s up to you to make the changes needed to make them successful. Ultimately, Facebook Ads are one of the best channels out there for business growth these days, but you have to approach them differently from other channels, especially considering that you’re approaching prospects, leads and customers with marketing messages in what they perceive as a decidedly non-commercial space. Don’t let that deter you. 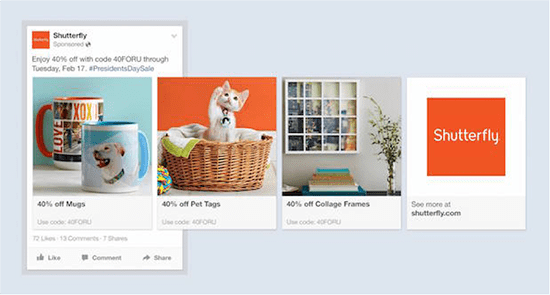 Thanks to Facebook’s extensive audience targeting options, the platform gives you the unique opportunity to both target users at all stages of your sales funnel and to adjust the messages they receive as they move through your sales process. Setting up effective Facebook Ads campaigns takes a bit of work, but in a digital world where competition is becoming stronger every day, it’s more than worth it. Think smart, and focus your efforts on the right areas to stand out. With the information I’ve shared above, Facebook Ads can be one of those areas.